I thought it would be fun to post some gumdrop cookies that I have made once before, but the recipe is in a Christmas book in a box, in the garage, in the rafters, and I didn't feel like going to the trouble to get it down. I may make that recipe for another week. Though they both involve gumdrops, they are quite different cookies. I googled "gumdrop cookies" and came up with this recipe from Paula Deen, and figured I couldn't go wrong using one of her recipes. I was right! These are an easy drop cookie and they taste great and have a wonderful texture with the oats. The gumdrops really soften up after the cookies are baked and add a festive, tasty touch :) I'm looking forward to checking on all the other Christmas cookies! 10 more weeks to go! Get in on the fun and join the bloghop! Preheat oven to 350˚. Line baking sheets with parchment paper. Using scissors, cut gumdrops into small pieces; set aside. In a large bowl, beat butter and sugars at medium speed with an electric mixer until creamy. Add eggs, one at a time, beating well after each addition. Beat in vanilla. In a medium bowl, combine flour, baking powder, baking soda, and salt; gradually add to butter mixture, beating until combined. Stir in oats and gumdrops. Roll dough into 1-inch balls. Place 2 inches apart on prepared baking sheets, and bake 10 minutes, or until lightly browned. Let cool on pans 2 minutes. Remove to wire racks to cool completely. Store in airtight containers. I have this recipe in one of her magazines, and I have never made them..but thinking I may need to. They looks so festive...but you have reminded me..I have a recipe somewhere for gumdrop bread...I need to find it! Welcome! These look so colorful - I bet my toddler would love them! Thanks for sharing! These sound like such a fun cookie. Just the thing to bring out the child in me. Oh, these are so fun! LOVE these!! How festive. I've never had gumdrops in cookies. But candy and cookies put together can't be a bad thing. So glad you joined this week. You are right - they look so festive! And you can't go wrong with Paula Dean! I never would have thought to put gumdrops in cookies. They sound delish! How pretty those cookies are with all of the different gumdrop colors! I bet the kids love them. i've never thought of baking with gumdrops. looking at this I definitely will get to that. I love gumdrops - but probably would eat the whole bag of them before any made it into the actual cookie. Well, then I would just have to eat the raw cookie dough, wouldn't I? What a really fun idea. I would have to make sure they aren't those funky spiced gumdrops. But that would be really fun to use all green and red ones for the holidays. These look soooo fun Sue!!! I bet my kids would love to make those, thanks for the great recipe! I was wondering what gumdrops were! Thanks for posting the photo! Now I know but I don't know what we call them here and if we would get so many jewel colours! Your cookies look so "Christmassy"! What fun cookies. I love the simple, buttery, drop cookies. They are instant gratification. These look so cheerful and delicious. So cute! They definitely look like Christmas. Cool cookies, really vibrant. I love the colored Gumdrops. Molto simpatici i tuoi biscotti, pur non essendo una festa italiana, da quando ho una figlia,Halloween mi piace sempre di più. E' una buona occasione per divertirsi in cucina ^_^ e le tue idee sono per me preziosi consigli! So colorful and fun to work with gumdrops.... and the cookies look so delicious too. 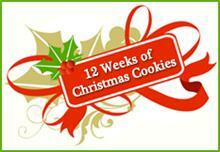 Good luck for the 12 week Christmas cookies... Must be so much fun :-) I might jump in on certain weeks! So festive! My kid loves gumdrops so I'm sure he would love these cookies! Sounds so fun, wish I had heard of it, think I would have loved to join in. Can't wait to see more of your yummy Christmas cookies to come. I listened to Christmas music all of today while I brain stormed ideas for my Christmas collections. Honestly, I was pleased to have an excuse to do so. I love the holidays! Great looking cookies! LOL Sue!!! It's October!! OK, so these look adorable. I often wondered how they worked with gooey gumdrops and crumbly cookies. I'll have to put them on my Christmas list. I've never had a cookie with gum drops. What a yummy, fun idea. What a colorful addition o use gumdrops. I would have never thought! Brilliant! Just found this recipe through On the Menu Monday at "StoneGable". I'm so glad to see it. My mother used to make these when we were kids, but I never had the recipe. This is a definite keeper!! Thanks!